For berry-loving birds, late summer and early fall in Southeast Texas, and indeed throughout much of the Southeast, must seem like heaven. It is at this time of year that many of the berry-producing plants in the wild begin to have ripening fruits and suddenly the birds are presented with a veritable banquet of a variety of some of their favorite foods. There are many native shrubs, trees and vines that produce berries that birds find tasty, but three in particular come to mind. These are pokeweed, elderberry, and beautyberry. Perhaps they spring to mind first because all three grow in my backyard. Our yard is, in most respects, a typical suburban yard, but it is unique in one way. It has a bit of wilderness that thrives along the back fence where all the plants were planted by birds and other creatures of Nature. This wild hedgerow has been allowed to grow there all these year partly on purpose and partly because we just never have gotten to that section of the yard in our remaking of our landscape. Even when we do get there though, I think the wild hedge will still survive. The birds love it too much to destroy it. 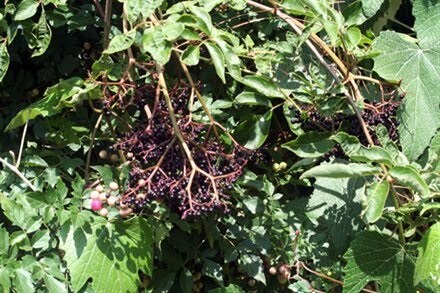 The hedge is made up of a tangle of shrubs and vines but it is given its structure by the berry-producing plants, pokeweed, elderberry and beautyberry. Usually the first of the three to ripen in summer is the pokeweed berries. A rangy pokeweed shrub hangs heavy with fruits in various stages from green to purple-black to bare stems already picked clean by the birds. A close-up view of the berries of the pokeweed. Now, pokeweed is a very versatile plant. It has a long and interesting history of use by humans from Native Americans right through to modern practitioners of herbal medicine and even some devotees of a Southern gourmet dish called "poke salet." I can't say that I've ever tasted poke salet but I had an uncle who liked it and looked forward to those first tender shoots each spring. We had a rampant patch of the stuff that grew near our barn and as soon as the shoots were above ground, Uncle Bud would come over and pick them for his "mess of salet." Uncle Bud may have been wiser than we knew because pokeweed has numerous medicinal qualities and usages. One of its common names is "cancer-root" and indeed it is being investigated for its possible utility in fighting that disease. But the birds couldn't care less about any of that. They just like the berries and as soon as they ripen, they are there to pick them. The chief picker in my yard is the mockingbird, always first in line when any berries are being served, but the other birds including cardinals and wrens get their share as well. The second berry to ripen, and it may actually sometimes be the first, is the elderberry. 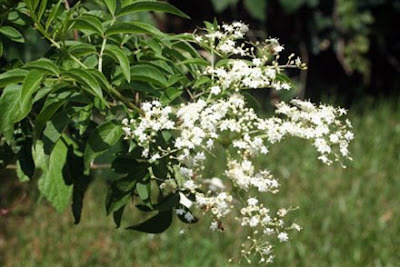 The elderberry actually has a rather lovely flower and when the large shrub, or small tree, is covered with these lacy white umbels it can be quite an attractive sight. Elderberry flowers are visited by butterflies, especially those of the swallowtail family, and by bees, so it has great utility for wildlife in addition to the birds. The tiny, shiny, almost black berries are plucked as soon as they ripen. You can see that several have already been taken from this bunch. By the way, those green and pinkish berries next to the elderberries are the berries of a vine that I know as the "pepper vine," although I'm not sure that is its correct name. Birds like them, too. 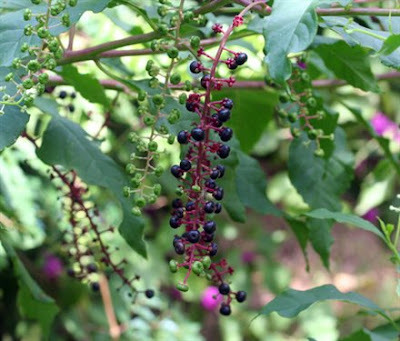 In addition to its uses to wildlife, elderberry, too, has a long history of usage for humans. The flowers are said to make a tasty tea and, of course, the berries can be eaten by humans as well as animals and they can be used to make (I'm told) a very passable homemade wine. If you want to use the berries, though, you'll have to be quick! The birds are watching and waiting and once the berries turn that shiny purple-black, they will not be long on the plant. 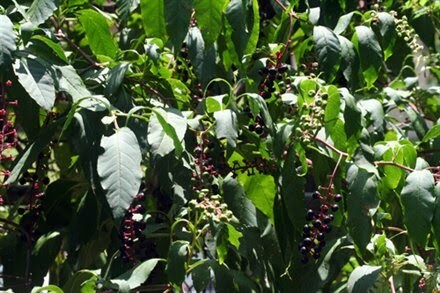 The last of the three berries to ripen and the longest lasting on the shrub is the beautyberry. 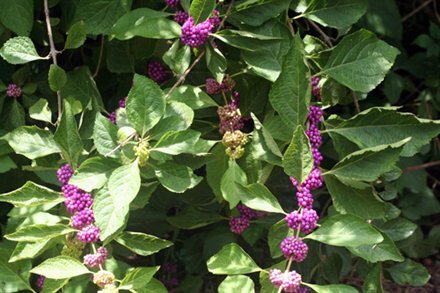 The beautyberry is well-named for these berries do make a very attractive display, and the plant, with its gracefully arching limbs, is being used more and more in landscapes by native plant aficionados. The beautyberries generally hang on their plant into the late fall and winter, so we can infer that they are not quite as tasty to the birds as the other two berries. This could also simply be because this is a much more substantial berry that doesn't quickly perish. The other two are soft berries and if they are not eaten soon after ripening, they will disintegrate. The beautyberries, though, hold up well and are a boon to the mockingbird, as well as other berry-lovers, far into winter. They offer a welcome variety to the diet of the birds in that season. If you are a person who likes to use native plants and to garden for wildlife, especially birds, you might consider adding some of these plants to your landscape. Neither the pokeweed nor the elderberry is an especially attractive plant, so you might want to look for an out-of-the-way spot to grow them. Beautyberry, on the other hand, makes a lovely show and would be an asset in almost any landscape. 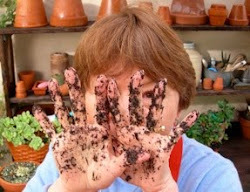 Plant these shrubs - or even let the birds plant them - and, trust me, the berry-pickers will flock to your yard. We do berries here too--dewberry, dwarf barbados cherry, hollies and Texas Persimmon. 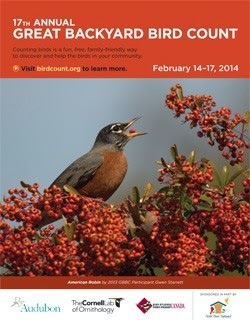 Our beauty berries bring the Bewick's Wrens and cardinals right up to our bedroom windows. Some years during our time in Florida, a riot of robins would sweep through and spend the day eating the beauty berries. The mockingbird was exhausted from trying to scare off the intruders. Love the berries and the berry-lovin' birds. I can imagine your mockingbird driving himself to exhaustion in his attempts to protect his "stash". Nobody likes these berries more than mockers.